Shooting Star PWDs | Join us and find out about this wonderful breed! Make sure it’s a positive reinforcement school. Puppies do not understand punishment – If you punish them (yell, spank, give an overly-long time out), the only thing they understand is that their owner is unpredictable and sometimes hurts them. Really. Choke collars, prong collars and shock collars on a puppy are a huge no-no! If you see a school that puts this on a puppy, steer clear. Most chain pet stores (Petco, PetSmart) have instructors with limited knowledge of puppy and dog behavior. Part of your goal is to become educated on your dogs behavior, and if you are learning from someone that is still learning themselves you’re probably not getting what you need. Ask to go and observe a class. Any training school that is proud of what they do will let you sit in on a class to observe or “audit”. Watch how the instructor interacts with the owners. Watch how the owners are learning to work with their puppies. Going with your “gut” is always helpful! Your instructor should be knowledgeable on dog behavior and pack mentality. He/she should be aware of puppies that are overly confident (they can easily turn into bullies) and puppies that are overly shy (they can easily develop fear aggression). Having certifications after their name is always nice, but not always needed. Like other professions, there are many different companies that will take your hundreds of dollars to give you initials after your name. You can have a really great instructor that does not have certifications, but can still be savvy with dog language and has the proper experience. If your puppy is under (around) four months old, don’t be worried if your class does not include too many commands. It should have a few basic tricks, like sit, down, pay attention. But it should mostly include socialization time. Structured interaction with the other puppies. Structured interaction with the people. Safe introductions to scary objects (like vacuum cleaners and big brooms) is always great, because your puppy will go through a few different fear stages. Your instructor should be coaching you on how to work with your puppy so he/she can learn that none of these are worrisome. This is also a great class to teach you more about crate training, house-training and other “age appropriate” experiences. When you finally pick a training school that meets your requirements, don’t forget that you are your puppy’s advocate! If your puppy is in a situation that makes you feel uncomfortable, don’t be afraid to put a halt to it! This is a very fragile age, and one bad experience can alter the way your dog feels about things for the rest of their life! Some puppies will be afraid the first couple times they go to puppy class, that is very normal. But, if your puppy is put in a situation that makes you feel worried – Speak out! Let the instructor know that you are going to pick up your puppy, or take your puppy out of that situation. Yes, it’s okay to do this! It’s also okay to remove your puppy from a situation in that moment, and then talk to your instructor about it later. Any instructor that is confident with what they are doing will not put blame on you, or tell you that your puppy is bad, or talk bad about others. They will (or, they *should*) encourage conversation and use this as an education time to share knowledge about how to prevent the situation from happening in the first place, or how to correctly work through it if it happens again. If you can find a good Puppy Playgroup near you, consider yourself very lucky! Take advantage of it as often as you can during these first few months after you bring your puppy home. The more supervised socialization you can give your puppy during this time, the better! Playgroups will often offer a larger group of puppies, so the chances of your puppy finding a fun playmate are even greater. 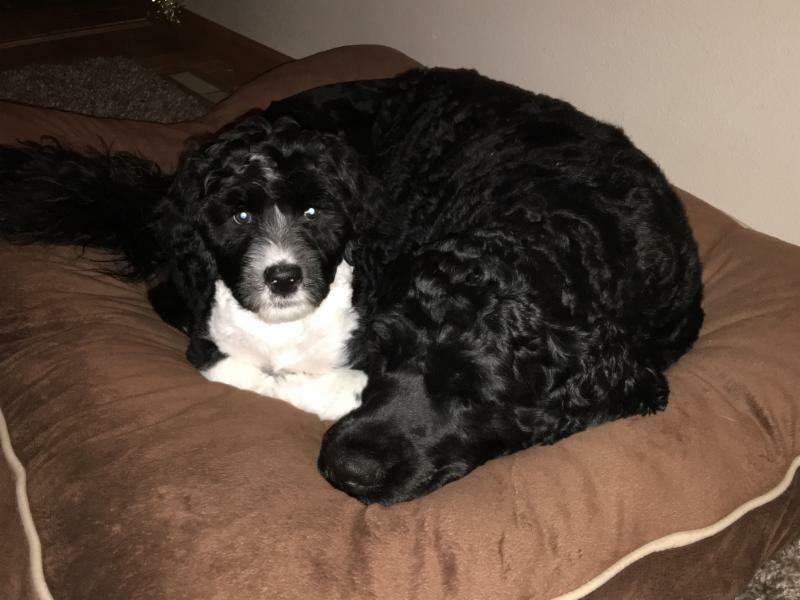 The two biggest things we see in puppies at this age, and to look out for, are the puppies that want to jump on everyone (overly bold), or the puppies that want to hide and become invisible. If your puppy is overly confident, you may want to become a “hovering” owner for a while. This means always being within arms-reach of your puppy, so you can quickly and gently redirect him if he gets too rowdy with his playmate. Your class instructor should be able to coach you on good timing with this. I am of the opinion that continually diffusing play will help to elevate it from escalating in the first place. Simply showing your puppy a treat and having him turn his head towards you while he’s playing is great. Do this every 30-60 seconds while he’s playing. This also teaches him that when he’s playing and you approach, it’s a good thing! Say your puppy is shy. It’s his first time at puppy class. All he wants to do his hide under the chair. That’s okay! Let him! Don’t try to slide him out to say hi to the other puppies. Let him do it on his own time. If he’s cool with observing playtime under the chair, that’s a-okay. Some puppies may come over to him to sniff him. That’s okay too, to a point. If you see that a puppy is not just sniffing him, but maybe trying to paw at him, or starts to bark at him, the instructor or owner of that puppy should immediately redirect that puppy away. If they don’t, this is when you need to intervene and remove your puppy from that situation. Don’t forget to be your puppy’s advocate! If you have older dogs that are appropriate, by all means let your puppy play with them. Often older dogs don’t really want to have anything to do with young puppies, and that’s okay too. If you find this is the case, be respectful of the adult dog and remove the puppy (this way you eliminate putting the adult dog in a situation where they feel as though they need to correct the puppy). This still holds true with two of my dogs, Axl (almost two years) and Tallulah (almost 6 months). Tallulah is an energizer bunny and Axl is my strong and steady guy. Okay, I say strong and steady, but keep in mind, we play in our 3.5 acre fenced in back yard for hours a day. Hours! So, when Axl is ready for a break, he puts himself in a “safe” spot. He will either hop on the couch, my bed, or go in his crate. This takes him away from his little sister who will constantly be chewing on his leg or tail to get him to keep playing. When he’s done he doesn’t have to correct her, but can calmly get away from her. It’s not bad for a puppy to play with adult dogs that are appropriate, but right now your young puppy really needs the interaction of other puppies. 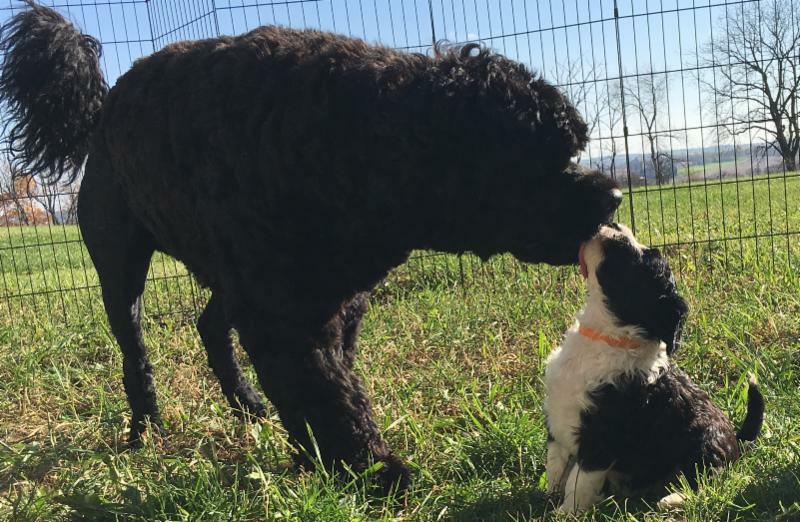 Portuguese Water Dogs grow up in the litter learning how to play with other PWDs. Boxer puppies learn how to play like Boxers. Introducing them to different breeds and play styles at this age is ultra-important. Another reason why playing with other puppies is important is they learn better bite inhibition. This is where they learn how hard they can bite down whilst playing. If a puppy is playing and bites down too hard, the other puppy will say “no way”! They’ll stop playing with that puppy. If your puppy regularly plays with an adult dog, they will probably learn that they can bite down harder. Nope, this is not a good thing! Because when they go to play with another puppy, they will be perceived as a bully for biting too hard (and then no one will want to play with them! )… Remember to get them around other appropriate puppies as often as you can. Here is my answer when someone asks if they should take their puppy to a dog park, NO. Absolutely not. There is not even a question in my mind or a situation where it might be okay. But, I have plenty of reasons why it’s not okay! There are tons of adult dogs that simply don’t like puppies. I saw a 4-month old Akita get it’s eyeball bit out by an adult Labrador. Yes, it’s eyeball. And, the Lab’s owners were nowhere to be seen. Nice. Dog parks are often full of adolescent dogs with zero manners. They will bum-rush a puppy and start jumping on it and acting like a total bully. Think this could create your puppy to grow up to be a reactive dog? One that barks at other dogs when they run up to it? Yep. I work with families that have highly aggressive dogs almost every day. I can’t tell you how many of them have gone to dog parks, to “see how he does”. If your puppy doesn’t have a reliable recall (and, he’s a puppy, so chances are he does not), and you take him to an off-leash dog park…. He’s smart – He’ll start to understand that when he goes to the dog park and he’s 50’ away from you, he doesn’t’ have to listen. Believe me, I could go on and on about the reasons why puppies shouldn’t go to dog parks! Dog Daycares are not for all breeds, and if you choose to take your puppy to one I would be extremely careful. There are many different things to look for in a dog daycare (this is a whole article by itself! ), but if you’re thinking of taking your puppy, just make sure they have a “puppy area” and it is really just for puppies…. I always say that if you’re only going to take your dog to one class during its lifetime, then take it to a puppy class. But, in reality, PWDs are a breed that are so highly intelligent, it would almost be a disservice to attend one class and then stop. Their minds keep going through adulthood and even into their senior years! Keep going to classes with them! Find your “nitch” and do what you enjoy! There are many things you can do with your pup! Water work, confirmation, rally, agility, nosework, tracking, search and rescue, therapy work, etc. Did you know that you can teach your dog to read? Yes! It’s crazy how many fun and cool things you can do with your dog. And, your dog will LOVE it! Okay, let me just end this article with talking about treats. 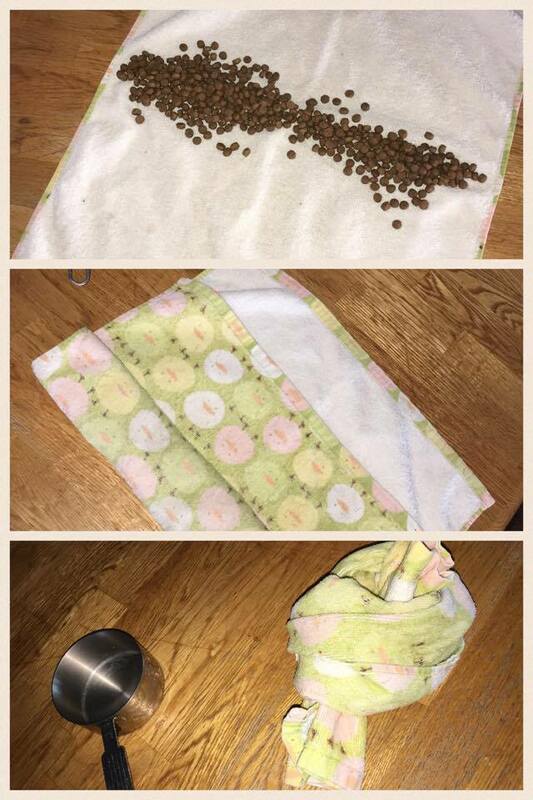 Please-Please-Please use high-value treats when you’re training with your puppy. Training is all about motivating your dog to do something, and creating a positive association with what they are doing. Take “coming when called” for example. If you called your dog and then clipped its toenails, do you think your dog would want to come to you the next time you called it? Probably not. But, if you called your dog, and for 10 times in a row it got high value treats (like cut-up chicken, cheese, liver, steak, etc.). Do you think that eleventh time you called it, it would come-a-runnin’? You betcha! Use super-awesome treats when you’re training your dog. Your dog will learn to love training time and always be up for more! Please request permission to copy. 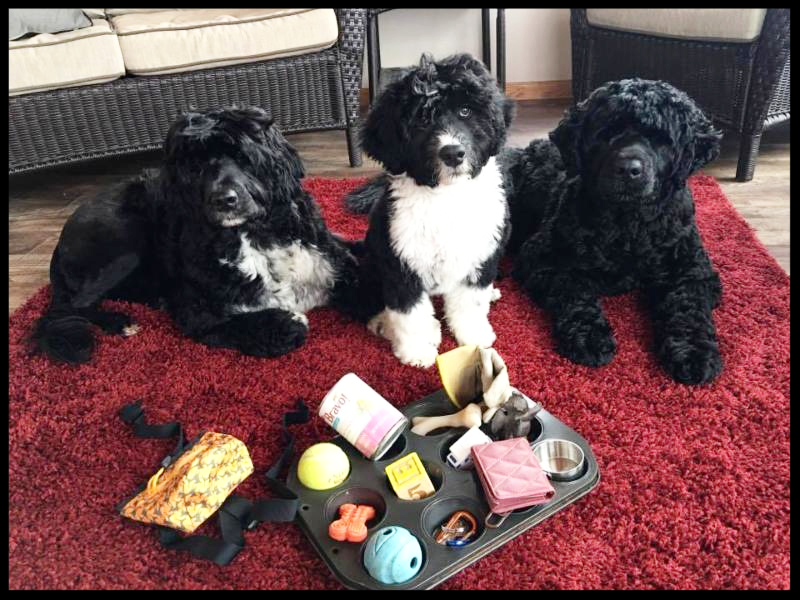 Originally written for the Portuguese Water Dog Club of Greater Chicagoland, Shorelines Newsletter. You did it! You took the plunge and dove into the world of puppy-dom! Congratulations – You now have a lifelong pal. Let’s get started on the right foot with this little baby – They grow up fast, and if you know dogs at all, you’ll know that through that cuteness is a brilliant being that is just waiting to take over your home! Mua-ha-ha! Since you just got a puppy, there is a good chance you already have a dog at home (they are like potato chips, right? Once you fall in love with dogs, it’s hard to have just one!). You want to work to set up a great introduction for your resident dog/s and your new puppy. 1. Act like they are not worthy and grovel in front of the dog. Curling themselves into a little ball and crawling around in low circles (please don’t kill me, I mean you no harm!). But watch out, these guys are smart little critters. What they’re really doing is testing the waters to see how the adult dog will react to them! OH yes,they’re smart! 2. You may have a bold little puppy that runs straight up to your resident adult dog and immediately starts to jump on them, or even hump them! Don’t worry, this is a very common and natural behavior. You didn’t get a dud. However – You don’t want your adult dog to be thinking “gimme a break, what have they brought into my world”! Adult dogs will correct puppies if they feel as though the puppy is being rude, and most of them are actually very appropriate and good at it. But, you don’t really want your dog to get to the point of feeling as though they need to. This is the time to intervene. Gently take your puppy and guide them off of your grown dog. Show them a toy or otherwise redirect them to something that is appropriate to do. Remember, this is their first meeting/greeting and it’s your job to help it go without incident. Six-week old Puppy, Morgan, getting licked by 1.5 year old Axl. Axl obviously didn’t read this article! 3. Sometimes puppies will lick the muzzle of an adult dog. 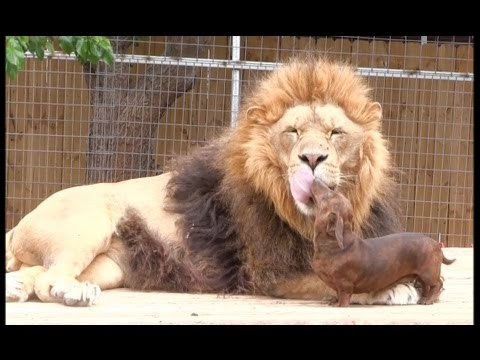 While this is endearing, because we know that it’s an appeasement behavior, sometimes that little adorable puppy can be “obsessively” licking the grown-up. The adult dog will be turning their head from side-to-side, and sometimes even trying to walk away from the little licking machine. If you notice this, again, time to intervene. If you can help prevent your adult dog from feeling like he/she needs to correct, great. Everything can stay calm and the puppy will still learn good impulse control from the fact that he didn’t get what he wanted (and what he wanted in that situation is some type of reaction from the adult dog). Yes, muzzle licking is a way of puppies getting attention from adult dogs in a way that they know how. 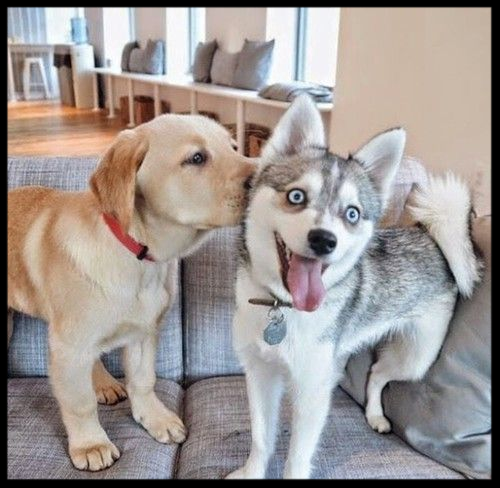 But, when you look at it and realize that your cute puppy that can do no wrong is actually licking the adult dog to purposely annoy it – Then intervene! You may find that your adult dog still corrects your puppy, and most dogs are very good at doing this. Your puppy will have learned a lot from its dam and its breeder or foster parent, so you can take the fact that they have started down their road of good socialization and continue with it. If you see your adult dog correct your puppy (and it’s appropriate – a quick mouth over the puppy’s muzzle, or sometimes they will pin a puppy down, or sometimes they may give it a good loud bark in the face), it should only last for a split second and then be done. However, your puppy will literally act like it’s being murdered! It will run away screaming and crying. The best thing to do is to totally ignore BOTH dogs. If the correction was warranted and appropriate, there should not be blood or scratches, and both dogs should get over it within a minute. Quick. Done. Puppy learned an important lesson. Don’t annoy older dog. A great way to have two dogs enjoy each others company is to take a walk. Since your puppy is little, “forced walks” are not recommended quite yet, but a couple back-and-forths up and down the driveway can also do the trick! Movement helps to reduce stress. Have both dogs on leashes (two handlers for two dogs) and walk parallel to each other, up and down the driveway. Once you notice that they are both cool with each other, then let them off their leashes in a safe, fenced-in yard. After a while, if you see that they are becoming pals (or, at least the older dog is tolerating the puppy! ), you can probably figure it’s okay to bring them into the house. Some adult dogs will start to engage and play with the puppy the right away. This is always fun because, of course, you want them to be friends. But, some adult dogs don’t want to have a thing to do with young puppies. They are of no use to them! Maybe when the puppy is around 4-6 months, the adult dog will figure that it’s actually staying, and it’s old enough to play with (just like husbands that don’t really know what to do with an infant, but once the baby can interact with adult humans, the husbands can have fun with them!). Every dog is different. I know your puppy is brand new and you want to give it oodles of attention, but – Remember, your resident dog comes first! I would bring puppy into the house – on leash – and walk him in the main room that you’ll be in for the next few hours. Maybe play for a few minutes, but then I’d put him in his crate. Your adult dog needs to feel like he/she can still relax without a puppy annoying him whilst he’s trying to nap on the couch. Plus, frequent crate breaks are so very important for young puppies! It not only helps to teach them great impulse control, but it helps them to take a little break. Many times I’ll have puppy owners tell me that they are at their wits end because the puppy keeps biting at them, or grabbing things it shouldn’t, etc. I find that they are only crating the puppy at night, or when they leave. These young babies can easily get over tired! Just like a kid, when they are overtired they tend to get out of their brains! I am quick to give a puppy a crate-rest, probably every 45 minutes or so. The time in the crate doesn’t need to be long – Two minutes? Three minutes? Just enough time to help them learn to calm themselves down. Once they do, you can let them out of their crate. But, you may find that many times during a crate break, your puppy will actually fall asleep. They are babies! This gives them the naps they need and the impulse control practice that is invaluable as they get older. We get these little bundles home and want to take them everywhere and have them see everyone we know! Take the first week-or-so to just relax with your puppy. Let him get to know you and your other dog. The energy of your house, the routine of your family. Then slowly start to introduce him to friends and slowly start to take him places. You have his whole life ahead of him, so take these first couple weeks slowly and let him acclimate to his new life. Use the CODE: connectwithmydog10 and get $10 off your next class! We all know, or at least I hope we do, that puppy-hood is a critical time for socialization. We take our puppies to class, let them romp around with other puppies, it’s adorable. They learn how to play well with other breeds, play styles, they’re doing great! Maybe we started taking them to dog daycare on the days that we have to work long hours. Or if we know we’ll be gone that evening. They are young and have lots of bugs they need to get out! But then at some point we stop taking them to daycare. Sometimes it’s because we have another dog at home, so we figure he can play and continue his socialization with him. Or, time just flies way too fast and before we know it, our puppy is now 18 months old and hasn’t really played with another dog for 6 months. Or maybe we had a bad experience at the dog park and just haven’t returned. If your dog is regularly socialized with a variety of friendly and appropriate dogs, he will feel comfortable around other dogs. Whatever the case may be, if your dog does not regularly play with friendly, social dogs, he could literally lose his sociability manners and become a, wait for it, “doggy nerd” (insert dramatic music, Dun-Dun-Dun! )… Just like learning a foreign language, if you are not using it regularly in conversation, you will soon forget it. When I owned my dog daycare, we had a rule for dogs returning to play; if they had been gone for more than two months, they had go to through our evaluation process just as though they were a brand new dog coming to play. Yep, just two months, that’s how short it can take! Plus, when you have a dog daycare, new dogs are coming in all the time, so if you have a returning dog, they may know *some* of the dogs there, but not all of them. That is versus. a dog that is there 2-3 days a week and sees a new dog come in – They are not the “newbie”, the other dog is. Dog-Dog reactivity takes up probably 80% of my private lessons. I will often hear people say “I don’t get it, he went to puppy class”… Speaking of their now two-year old dog. Yep, if they don’t use it, they lose it. It would be like taking a 5-year old child to kindergarten, then keeping them home (without seeing other kids) until college – Hmmm. My guess is they’d have a pretty tough time! 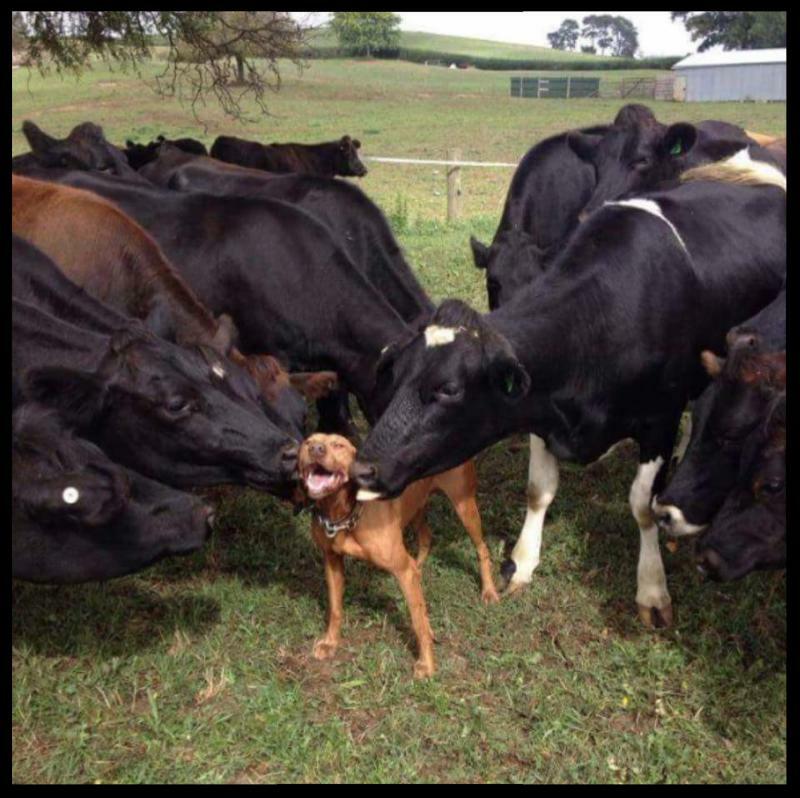 If your dog is regularly socialized with a variety of friendly and appropriate cows, he will feel comfortable around other cows. Don’t worry, if you have a doggy nerd, we can totally help. Sometimes their nerdiness or frustration may come out in barking at other dogs, lunging, acting like a fool when they see a dog. Sometimes it can be fear based, air-snapping, standing behind you, or maybe just feeling overwhelmed to the point where they can’t even bear to take a treat when they are in the presence of another dog. We’ve got this awesome class called Focused & Confident. I named it originally because I was thinking of the dogs, but through the years the title of the class has changed meanings – It originally was to have our dogs focused and confident. Being able to pay attention us and listen even when there were high-level distractions around us. But, through the years, the title has also become a goal for our owners. Focused, so you can learn to read your dogs signals and truly understand what he’s going through and what his though process is like. And Confident, this class gives you the confidence that you can totally do this – You’ve got it! Once your dog understands that he doesn’t have to worry about the situation, because you’ve got it under control and you won’t let anything happen to him, he can become much more relaxed… And hence, focus on you and become more confident (man, I could go around and around with those words, couldn’t I?). haha! You get the point. I think this class is amazingly helpful for everyone, not just those of us that have dogs that are reactive, or fearful, or not listening. It’s like going to the Dentist every six months, preventative care. Man, if we could get to everyone BEFORE their dog became reactive, wowsa!!! Let’s do it! I’m looking forward to seeing you and your dog in class! Giene Keyes is the Owner of Dog Face Training, winning Best of Madison, Gold for the past three years in a row, she provides positive in-home and group training for you and your pet. She specializes in aggressive dogs and difficult cases. Having successfully owned one of the first dog daycares in the Madison area, she now consults for daycares and training companies on dog body language, managing a pack and much more. She is an Instructor with the American Red Cross in Pet CPR and First Aid, a Certified Canine Good Citizen Evaluator with the American Kennel Club, and a Licensed Judge with the WI Dept of Ag, Trade & Consumer Protection. Giene is a member of the Association of Pet Dog Trainers and is a Certified Pet Dog Trainer. She routinely presents seminars on dog behavior and training. Giene has been a regular guest on popular Madison radio shows, as well as morning and evening newscasts. She has been featured in numerous trade magazines, newspapers and was even on the cover for Wisconsin Woman. She enjoys holding training workshops and seminars across the state. When she’s not working, she is enjoying mother nature on her farmette in Southern Wisconsin with her husband, children, Portuguese Water Dogs, cats, rats, tortoises, chickens and pot bellied pigs (which of course are clicker-trained!). We are going on a hike this Sunday and we want you to join us! We’ll be hiking at 9:00am this Sunday, June 19th at the Badger Prairie Park in Verona. We will be meeting near the off-leash dog park area where the trail starts. This isn’t a class (it’s FREE), it’s just for fun! All Ages, all breeds, all levels of training. The only thing we ask is that your dog is friendly and social – This is not a training class, so please be respectful and don’t bring dogs that are aggressive or reactive. Hey, did you know we have class that focuses on MANNERS starting tomorrow? It’s our Dog One Class, 7:45pm at our downtown location at Dog Haus University! It’s only 4-weeks long and $75 – Click here to join!! Here’s where we’ll be, bring your dog and join the fun! If you come (which, we hope you do! ), please be responsible and only bring dogs that are well-mannered, friendly and socialized properly. We want this to be a fun time for everyone! Wait, you say this may be a little overwhelming for your dog? Hey, we won’t judge, we’d love to see you even if you don’t have your dog with you! * = The Ice Cream Socials and Dog Hikes are Not Dog Face sanctioned events. These are just places where we will be hanging out with our own dogs and would be happy to have you join us! By attending you are acknowledging that you fully understand that you and anyone with you will be attending at your own risk. 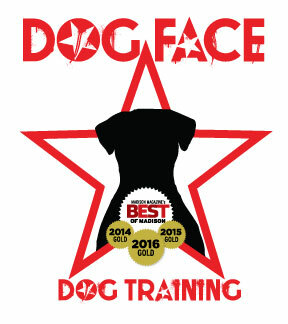 Dog Face OUTDOOR CLASSES for Spring! Our OUTDOOR CLASSES for spring are on the schedule! Yes, training your dog inside is great, but what happens when you go outside? Does your training go out the window too? We will work on the type of distractions you’ll find when taking your dog out and about, like passing other dog/owner teams, having kids and bikes go past you, and even going into a store! Because of the social nature of this class, all dogs must be dog and human friendly! This is for dogs that have completed Levels One and Two (some dogs take Levels One and Two multiple times – Different classes mean different dogs and different energy…). In the Level Three Class we take what we have learned and apply it to real life – OUTSIDE life… Yes, we take field trips in our Level Three Class. This is for owners that want the best-of-the-best. I *highly* recommend this class for ALL owners that want to take their dog with them outside, walks, camping, hiking, festivals…. I think every owner-dog team will benefit from these classes! Dogs have a very keen sense of smell-100,000 times stronger than humans! That’s why dogs are often used to find lost people and animals, drugs, avalanche and disaster victims, and even to detect cancer and oncoming seizures. Tracking is a canine sport that demonstrates a dog’s natural ability to recognize and follow a scent, and is the foundation of canine search and rescue work. In tracking the dog is completely in charge, because only he knows how to use his nose to find and follow the track. I can’t get enough of Tracking with my dogs because it’s something that they love, and I enjoy spending time with them outside! We love to get out in the fresh air with our dogs! We’re looking forward to you joining us outside this spring! Just like daycares or classes for children, there is always the risk that a dog can catch a virus or cold from socializing with other dogs, or simply being near them. Not only can they catch something at class, daycare or the kennel, they can catch it from the dog park, going into a pet store, passing another dog on the street – Almost anywhere! Some dogs have a higher immune system and do not catch as many viruses; some immune systems in dogs are lower or immature, and are more susceptible. Bordetella is a bacteria, although there are other viruses that can be a part of the complex. Usually sounds like your dog has something caught in his throat and is trying to cough it up. Dogs do not cough constantly, but usually when they get up from lying down, have been running, eating, etc. Sometimes their eyes may be goopy and they may have a runny nose. Just like a flu shot, you dog may be vaccinated for kennel cough, but may still acquire it. Kennel Cough, or Canine Cough is an airborne bacteria, so your dog could get it anywhere, even if they never leave their own backyard. You could pick it up on your shoes while walking down the sidewalk and bring it home, they could get it from stepping into a pet store or a vet’s office – even without ever greeting another dog! Recognized as one of the most common waterborne diseases. Dogs are most likely to get this from drinking standing water from a puddle at a dog park or while on a walk. Our veterinarian states that it is highly unlikely they would acquire Giardia from drinking from the water bowls at daycare or boarding. They could, however, contract Giardia from eating the feces of an infected dog. Some symptoms are diarrhea, gas, greasy stools, and nausea. Also called “Puppy Warts”. This virus can only be spread among dogs. To become infected, the dog generally needs an immature immune system, thus this infection is primarily one of young dogs and puppies. Viral Papillomas are round, often having a rough, jagged surface looking like a sea anemone or a cauliflower. They occur usually on the lips and muzzle of a young dog. 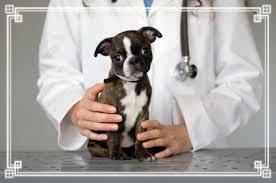 In most cases treatment is unnecessary, but it is always advised to check with your veterinarian. Just like at a child daycare or even at your workplace, there is always the possibility that your dog can catch a cold or virus from socializing with other dogs. Not only can they catch it at class or at dog daycare, but at a kennel, the dog park, the pet store, or even just meeting other dogs on their walks. If you notice any of these symptoms in your dog, please keep him from social settings, and talk to your veterinarian. Thanks to Dr. Jesse Sondel of Sondel Family Veterinary Clinic, and Dr. Sarah Kalstrup of True Veterinary Care for their input on this information!